The Mary D. Hume lays in the shallows of the Rouge River in Oregon. Always one of my favorites! FYI, smugmug's "Most Popular" has a new algorithm and is only picking up shots that have been uploaded on that day. Then, comments will cause the images to move to the front. Images have to receive comments throughout the day to stay on the pages. That is why I have included your name in a list of links to folks that have participated in the dailies, because, since you don't upload a lot of new images, I'm afraid your fabulous photos won't ever make it to the "Most Popular" pages. You probably may not care about this, but I just wanted to let you know, in case. I shot this ship as well, but during the day. I love the late evening shot as it portrays the sinking so well and the sad occurrence. Great capture. 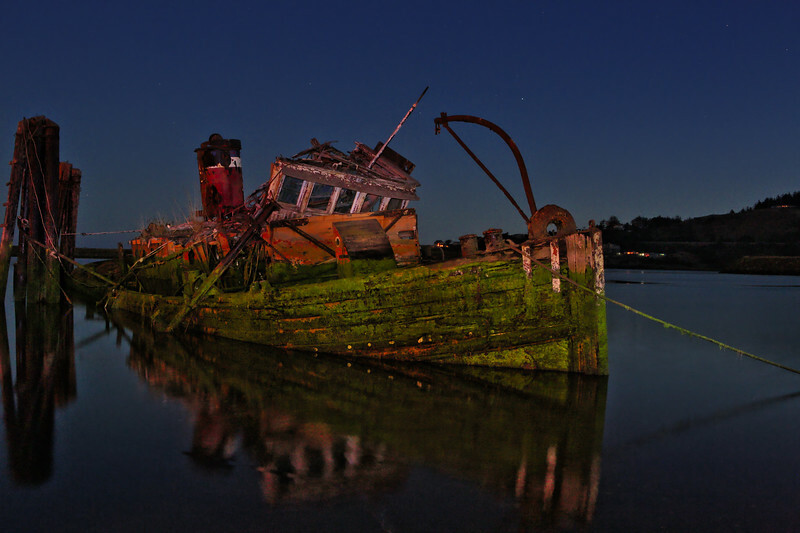 The low lighting refects the rather somber and sad scene of a boat at the end of its years. Lovely shot. Beautiful shot and reflection! I love the details. Love this - wonderful colors!! Just had to comment again...one of so many fabulous images, this one, nevertheless, is one of my favorites...superb comp and pp!